欢迎使用！Welcome! 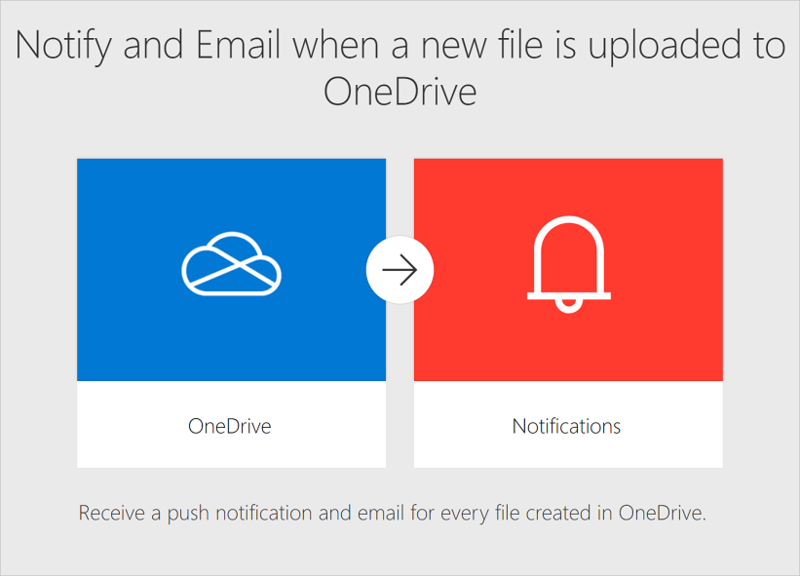 Microsoft Flow 是一种可用于在用户最喜欢的应用和服务之间创建自动化工作流的服务，其功能包括同步文件、获取通知、收集数据等。Microsoft Flow is a service that helps you create automated workflows between your favorite apps and services to synchronize files, get notifications, collect data and more. 流的主要类型是自动化、按钮、计划和业务流程流。The main types of flows are automated, button, scheduled, and business process flows. 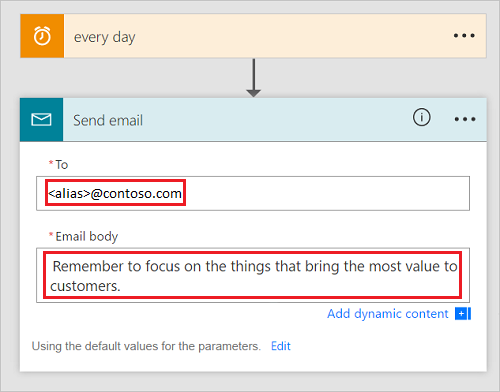 如果你是 Dynamics 365 Customer Engagement 客户，则可能还熟悉经典 Common Data Service 进程，它包括工作流、操作、移动任务流和对话框。If you are a Dynamics 365 customer engagement customizer, you may also be familiar with Classic Common Data Service processes which include, workflows, actions, mobile task flows, and dialogs. 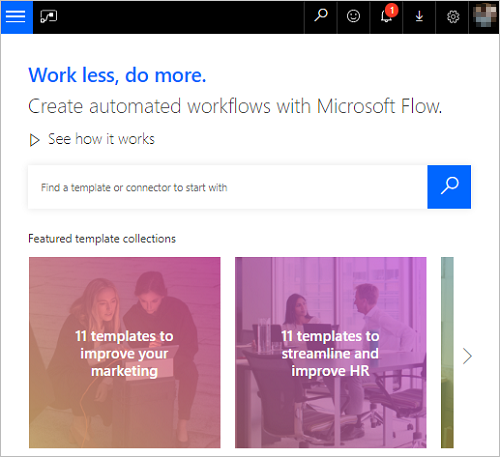 第一步是注册，或者，如果你已经有一个 Microsoft Flow 帐户，则可以在平板电脑、台式电脑，甚至手机上登录。The first step is to sign up, or, if you already have an account with Microsoft Flow, sign in on your tablet, desktop computer, or even your phone. 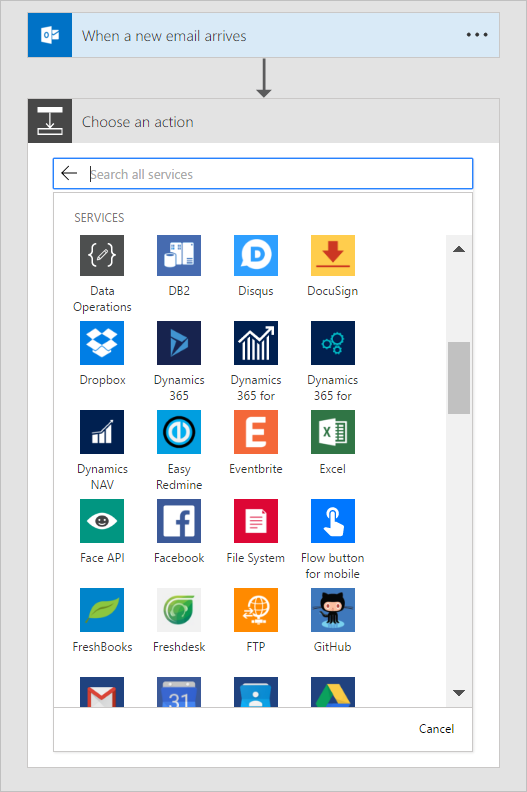 在 Microsoft Flow 的起始页上，你可以浏览不同的模板集，并了解 Microsoft Flow 的关键功能。On the start page for Microsoft Flow, you can explore a diverse set of templates and learn about the key features for Microsoft Flow. 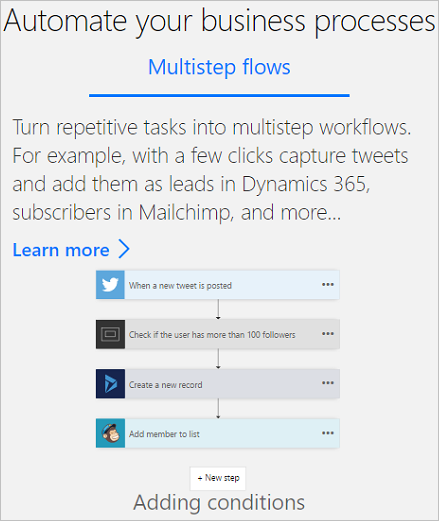 用户可以快速了解 Microsoft Flow 的功能及其对公司和个人的用处。You can get a quick sense of what's possible and how Microsoft Flow could help your business and your life. 轻松搜索模板和服务。Easily search for templates and services. 从最常用的服务中进行选择。Choose from the most popular services. 查阅每个流的概述。See an overview of each flow. 每个模板都设计有特定的用途。Each template is designed for a specific purpose. 例如，有可在老板向你发送电子邮件时通过系统向你发送短信的模板、用于将 Twitter 销售线索添加到 Dynamics 365 的模板，或者用于备份文件的模板。For example, there are templates for sending you a text message when your boss emails you, adding Twitter leads to Dynamics 365, or backing up your files. 这些模板都只是冰山一角。These templates are just the tip of the iceberg. 它们旨在激发你创建自定义流，以与自己所需的流程完全契合。They're intended to inspire you to create customized flows for the exact processes you need. 输入电子邮件地址，以便向其发送每日提醒。Enter the email addresses to which the daily reminder will be sent. 接下来，输入提醒消息。Next, enter the reminder message. 最后，选择“创建流”，然后验证流是否正常运行。Finally, select Create flow, and then verify that your flow is running as expected. 你可以浏览触发流的条件，以及该事件引发的操作。You can explore the conditions that trigger the flow and the action that results from that event. 调整相关设置，对流进行自定义。Play around with the settings to make the flow your own. 甚至可以添加或删除操作。You can even add or delete actions. 遵循本教程以了解有关基于模板创建流的详细信息。Follow this tutorial to learn more about creating flows from templates. 至此，你已经基于模板创建了第一个流，接下来，请使用 Microsoft Flow 所支持的超过 150 个数据源中的任何数据源，从头开始创建你自己的流。Now that you've created your first flow from a template, use any of the more than 150 data sources that Microsoft Flow supports to create your own flows from scratch. 按计划运行任务。Run tasks on a schedule. 观看运行中的流。Watch a flow in action. 从 Microsoft Teams 模板创建流。Create flows from a Microsoft Teams template. 下载适用于 Android、iOS 或 Windows Phone 的 Microsoft Flow 移动应用。Download the Microsoft Flow mobile app for Android, iOS, or Windows Phone. 借助此应用，你可以监视流活动、管理流并基于模板创建流。With this app, you can monitor flow activity, manage your flows and create flows from templates. 我们很想了解你可以通过 Microsoft Flow 做些什么，并且希望确保你有一个满意的体验。We're excited to see what you do with Microsoft Flow, and we want to ensure you have a great experience. 如需提问和分享创意，请务必查看我们的引导式学习课程并加入社区。Be sure to check out our guided learning tutorials and join our community to ask questions and share your ideas. 有问题请联系支持部门。Contact support if you run into any issues.